Born on February 26, 1876 in Ossendrecht in the Netherlands Pauline Munster’s was almost half of her final height straight from her mother’s womb. At birth, she was just over 12 inches. 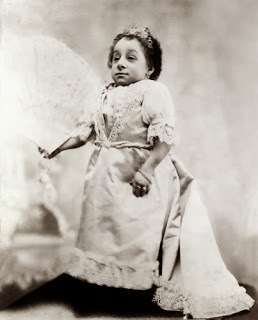 At age nine, the tiny dynamo weighed only three pounds and in adulthood Pauline Munster weighed less than nine pounds. Her measurements at age 19 were 181/2 -19-17, meaning she had curvy little figure and in truth she had no shortage of male suitors. Pauline began her profession career as an infant. At that time the public simply marveled at her tiny proportions, but as she grew older Pauline took to performing as well. She was eventually known for being an adept acrobat and for skilfully dancing with partners drawn from the audience. As her performances progressed in quality, Pauline took on many unique stage names. She was perhaps best known simply as Princess Pauline and on par with her name she took to wearing remarkable elegant gowns on stage, with details and stitching so minute that the garments themselves were a wonder to behold. During her career, Princess Pauline toured Belgium, Germany, France and Britain before being invited to perform in the United States in 1894. She debuted in New York City’s Proctor’s Theater on New Year’s Eve before a stunned and thoroughly charmed audience. She performed with a grace that moved those who saw her. She was a fairy, a tiny regal princess on a huge stage dancing what she felt in her heart – and it was beautiful. Princess Pauline quickly became the darling of New York. Tragically, while Pauline’s star burnt brilliantly, it expired far too quickly.Shortly after arriving in New York the diminutive Princess contracted pneumonia and meningitis. Pauline Musters succumbed to illness on March 1, 1895 in New York and the world lost its smallest but greatest miracle.